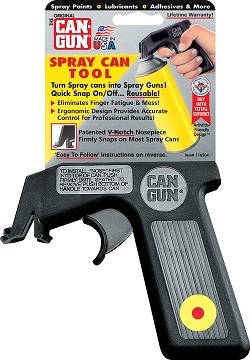 Since 1982 over 50 Million Original CanGun (OCG) Spray Can Tools have been sold worldwide. The Made in USA, reusable OCG received The Arthritis Foundation's "Favorable Review" and the Handyman Club of America's "Member Tested" Seal of Approval and may be quickly and securely attached (& removed and reused) onto all standard spray cans via the world's first and only patented "V-Grip" nosepiece. OCG's Award-Winning ergonomic handle and trigger design provides pain & fatigue-free, professional-style spraying from all standard spray cans.